Imagine Post-World War II America as servicemen returned to civilian life and started settling into new homes. The approval of the Servicemen’s Readjustment Act of 1944 – or the G.I. Bill – by President Franklin D. Roosevelt provided stability and security to these war veterans, including stipends covering tuition and expenses for college or trade schools and low-interest mortgages. As the demand for houses soared, developers were speedily building boxy, one-story or split-level single-family homes that were practical and well constructed – but lacking in architectural creativity and memorable features. Amid all the “cookie-cutter” homes sprouting across the country came a breath of fresh air in California when Joseph Leopold Eichler, a New Yorker who managed a successful family business, appeared on the scene and developed well-crafted, airy, light-filled, and affordable homes that attracted the suburban middle class. They were designed primarily in what we now call the mid-century modern style. This home in Palm Springs, CA, is a good example of the Mid-century Modern style made famous by Joseph Eichler in post-WWII housing developments in California. Note the simple lines and gull-wing, or butterfly, design of the roof. (Photo: © Matthew Bamberg | Dreamstime). 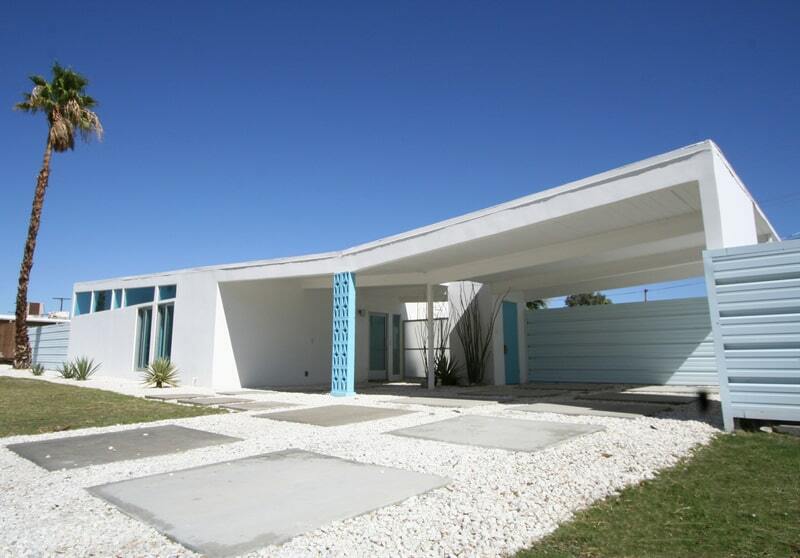 Joseph Eichler built more than 11,000 modernist homes in Northern and Southern California and New York State. While the homes were mass-produced, Eichler’s architects regularly revised old plans and created new ones to give the homes a custom feel. The exteriors of Eichler homes usually show garages, carports, and tall fences with private backyards. • A focus on the functional, efficient, and minimalist. The early Eichler homes with enclosed front courtyards were followed by homes centered on glass-sided, open-air atriums, then by larger ones with central galleries and spacious all-purpose rooms with skylights. Top: Can’t afford an Eichler? 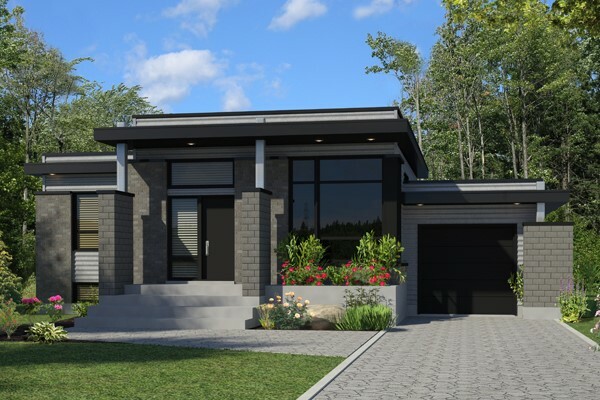 How about this Modern style 1-story, 2,923-sq.-ft., 3-bedroom, 3.5-bath home with a courtyard and an open floor design (Plan #100-1278)? 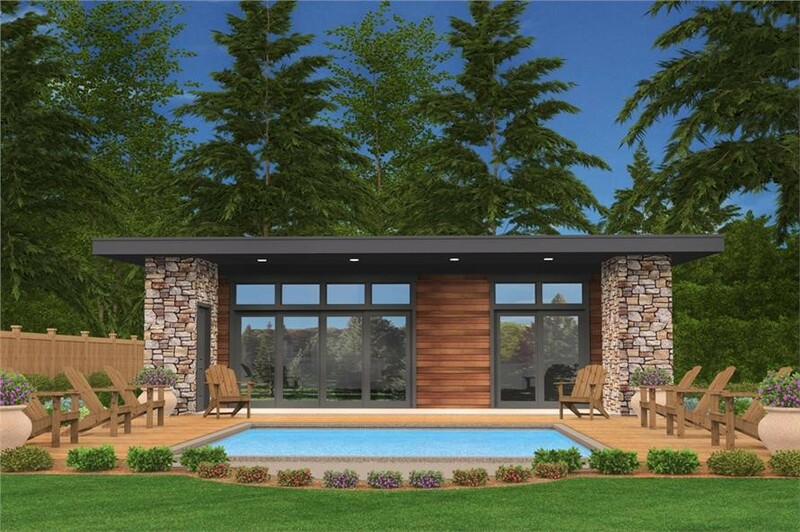 Middle: Or this lovely 1-story, 2-bedroom home with a distinctive flat roof (like some Eichlers), wood siding, and glass walls. 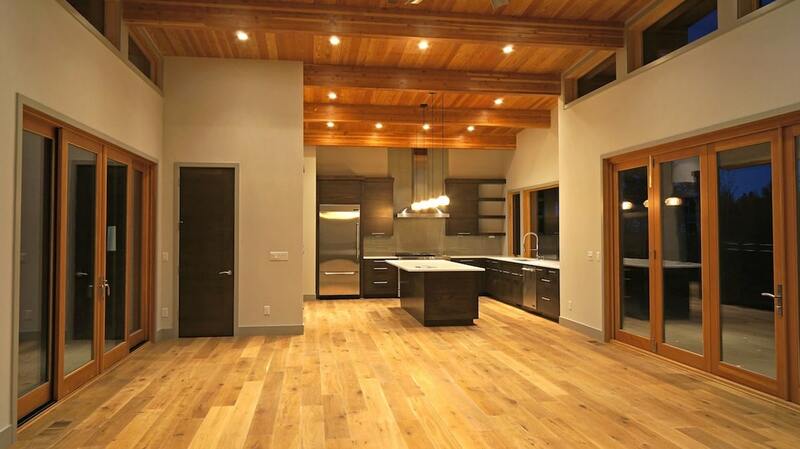 Bottom: Abundant sunshine filters into the home’s interior through the glass walls in this Great Room. Make a note of the wood trim and stacked stone that add charm to the space (Plan #149-1886). The true “Eichlers” were built only in California and New York. In his native state, Eichler managed to construct just three homes – all located in the village of Chestnut Ridge, New York. This 3,312-sq.-ft., 3-bedroom home (top) looks as if it could be taken from one of Joseph Eichler's California developments. Although it is larger than a typical Eichler, it has a light-filled atrium-like interior – evidenced by the Great Room (bottom) with high ceiling and clerestory windows in addition to lots of glass. The sliders on each side open to courtyards for outdoor living. The house also has vaulted ceilings, disdinctive roof profiles, an open floor plan, and minimalist design (Plan #202-1022). Born in the Bronx to European Jewish parents, Eichler was raised in a politically liberal family and grew up in the culturally diverse community of New York City. Although his parents were of modest means, Eichler attended New York University and graduated with a business degree. A career on Wall Street prepared him for a leadership role in the tough business world. When Eichler married Lilian Moncharsh – whose family owned a butter and eggs wholesale firm – he eventually worked for his in-laws and joined the competitive food industry. In 1940 Eichler moved with his wife and two sons to California so that he could assume the position of treasurer of the San Francisco-based family business. During their first years on the West Coast, the Eichlers lived in the Bazett House, a residence in Hillsborough that was an original design by Frank Lloyd Wright. The Bazett House heightened his admiration for Wright and his principles of open floor plans, clean lines, and harmony with nature. Living there further exposed Eichler to the intricacies of modernist architecture and fueled his interest to engage in something more creative – a passion encouraged by his wife, who had similar interests. Ultimately, a scandal surrounding the family business changed Eichler’s career path – and gave the architectural world the California modern style, a local, nature-inspired take on the architectural principles of modernists like Mies van der Rohe and Frank Lloyd Wright. Although Joseph Eichler was not an architect, he worked with famous designers and architects to build gorgeous and reasonably-priced homes that effectively linked the indoors and outdoors. At the end of World War II, Eichler started as an investor in the home-building industry before launching his own firm in 1947. The Sunnyvale Building Company constructed prefabricated houses for buyers who already owned lots. From the outset, Eichler had a vision of affordable homes that had a custom-design feel, with exposed wood beams, large windows, open spaces, indoor-outdoor relationship, and a sense of community in the neighborhood. In 1949, he hired two young architects, Robert Anshen and Steve Allen, out of the University of Pennsylvania to design the new Eichler family home. It was the beginning of a long and successful business relationship between Eichler and the firm of Anshen and Allen. In 1950, he commissioned Anshen and Allen to design prototypes for a 50-unit subdivision in Sunnyvale as well as in El Centro Gardens, Greer Park, Green Gables in Palo Alto, and Atherwood in Redwood City. 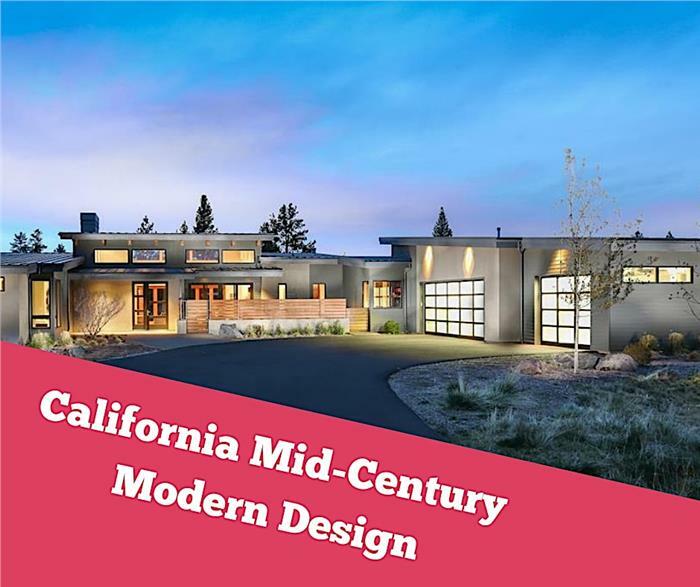 By 1954, the company had built 1,800 houses in the "California Modern" style with glass walls, post-and-beam construction, and open floor plans. From 1950 to 1967, Eichler would hire distinguished architects, including A. Quincy Jones, Claude Oakland, and Raphael Soriano, to design his quintessential California modern homes. 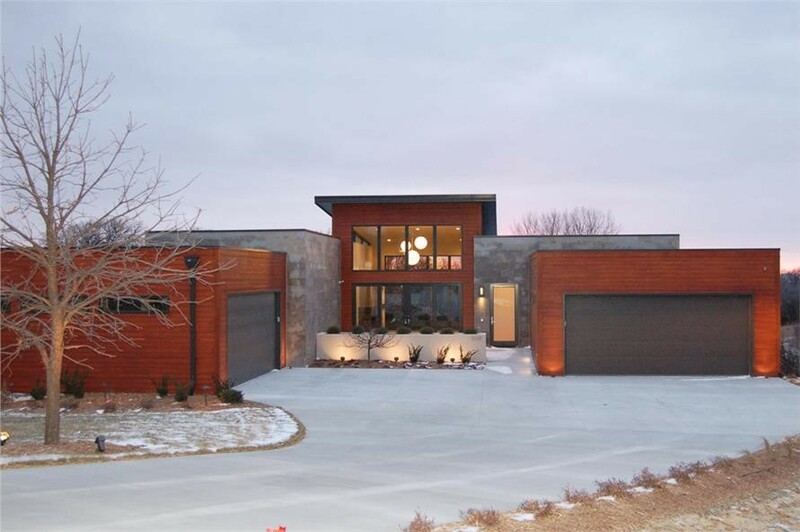 This 3-bedroom, 1-bath contemporary home is reminiscent of an Eichler tract home, with its modern mid-century style (Plan #158-1263). Most of the homes designed by Eichler’s architects were suburban single-family homes in Walnut Creek, Concord, and San Rafael. But in 1950, San Francisco's Redevelopment Agency laid the groundwork for an ambitious urban renewal plan for a hilltop in the middle of the city that had only 158 homes and 374 people. The plan for Diamond Heights – built from 1961 to 1981 with designs by architects including Claude Oakland, who was working for Joseph Eichler – called for family homes, apartments, high rises with spectacular views, a shopping center, churches, playgrounds, and schools. Diamond Heights was Eichler’s first project in a city redevelopment program – where he was given the opportunity to build 100 split-level or two-story family homes. Before long, Eichler homes “sprouted” on Amethyst, Amber, and Cameo Way. Architect Oakland came up with a hybrid model that would suit the neighborhood's hillside plots – and still feature Eichler’s basic concepts: small entry courtyards and open floor plans with floor-to-ceiling glass walls that connected the home’s interior to its exterior surroundings. The plain facades were taken up by garages on the ground level, while upper floors had narrow vertical windows. Sale prices ranged from $34,950 to $46,500 in 1962 dollars – based on one of six floor plans, each with three or four bedrooms. Although the Diamond Heights project received a lot of attention at the time, it is not as well recognized as other redevelopment projects in San Francisco. But to this day, it maintains its “California modern” touch and mid-century historical significance. This 4-bedroom, 3.5-bath home has elements that are reminiscent of Eichler's Diamond Heights ideas. The atrium in the center, the copious use of glass, the vertical orientation of some of the glassand the essentially squat nature of the design are all telltale signs of a Midcentury Modern home (Plan #202-1015). Eichler sold his company in 1967, but he continued to build houses till 1974. Experts agree that his best work was recorded from 1950 to 1967. His legacy lives to this day , however, with all the Eichler gems that have remained in families or been renovated through the years to preserve that creative vision he had in mind for the American suburbs. As a testament to the influence Joseph Eichler has on residential architecture, Eichler's aesthetic – exemplified by his typical homes – was the inspiration for the home of Pixar's Incredibles, an animated superhero family. 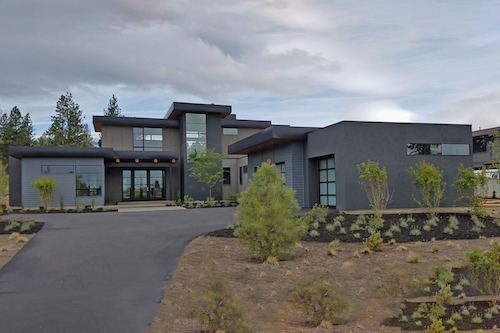 The roofline of the actual home they used as the model for the Incredibles' home had a shallow gable, and it was changed to a shallow gull wing, similar to the house shown at the top of this article. Aficionados of the Incredibles will remember that the home was destroyed at the end of the first movie. 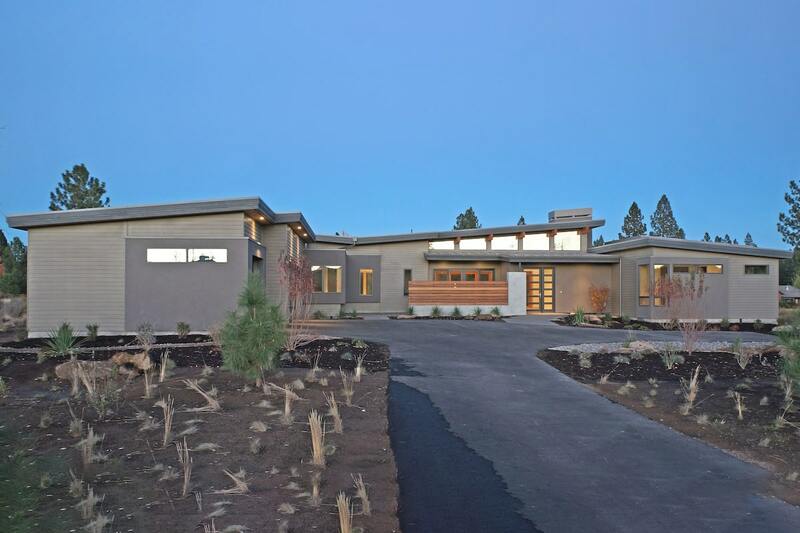 This 3-bedroom, 3.5-bath contemporary home is reminiscent of the Incredibles' imaginary one (Plan #149-1182). Joseph Eichler changed the landscape of residential architecture with modern design concepts that gave his homes both flair and function. While famous for his California Modern style, he left a more important legacy as a strong advocate for fair housing and as the first big developer to sell to minorities. Footnote: The lead image in this article is a Midcentury Modern home that evokes the homes that Joseph Eidhler made famous. 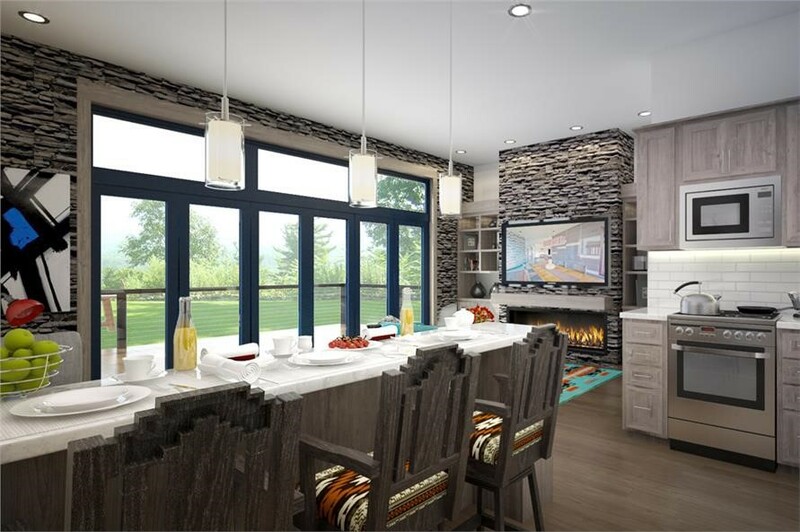 For more information on this 3-bedroom,, 3.5-bath home, click here (Plan #202-1013).